Laura’s Loom, UK, comes to visit! I’ve seen a few trees with branches of leaves turning to Fall colors and the goldenrod is tall and full of Autumn gold. Oops – rewind ~~~~~~~~~~~ I still have a few blogs from my summer to share! Laura Rosenzweig of Laura’s Loom, UK, came to visit me and Sheep & Shawl early in July. We are old friends from the days we worked together in Boston in environmental planning and mapping. 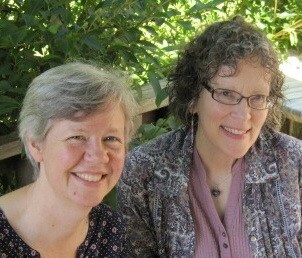 We’ve both changed our careers – using our hobbies in fiber arts – weaving and knitting – to create our own businesses. Laura has a well-established headstart in her expert handweaving, using silks, fine wools, and chenille. She has also been sourcing local and regional wool fleeces that she sees through all the processes from cleaning (scouring), carding, and spinning, to mill-woven finished throws and scarves. She has these woven at a small textile mill to her designs and specifications under the name Howgill Range (the region where she lives and sources the fleeces). She sells at UK fiber fairs, online, and through her studio, and takes commission work for her specially designed handwoven throws and silk scarves. I’m planning on selling a very limited quantity of these 2-ply yarns in the shop primarily for knitters, although weavers can also use them. To see and read more about Laura’s love of landscape and fiber arts, please read her website at www.laurasloom.co.uk.